Let me start by saying the original Bionic Commando was one of the games I played most on the 8-bit Nintendo. The only game I finished more than it to this day is probably Super Mario Brothers, the third being Mega Man, which I plan to review in an upcoming post. When I had an hour free to play a game, I beat Mario. When I had four hours free, I beat Bionic Commando. Mega Man could be difficult and wasn't the guaranteed win that I had in Mario and Bionic Commando (I'm looking at you, Gutsman!). To say I spent a good portion of my younger years on the original would be an understatement. I honestly don't want to know how much time I spent playing Bionic Commando because the results would likely be both shocking and a bit depressing. The designers made it a priority to stick as much as possible to the original look and feel of the game without having it actually look 8-bit. With that mission, they overwhelmingly succeeded. While the designers stuck to the original in most areas, there are some new additions. The main upgrades are in the music and graphics. It has a new soundtrack that takes advantage of current console capabilities while staying true to the music from the original. The melodies and themes are identical, just produced using modern synthesizers. As a huge devotee of the classic, the soundtrack made me feel right at home. The graphics were also completely re-done. Again, the developers took full advantage of the capabilities of the modern console and Rearmed really looks fantastic. Although it's technically a 2D side scrolling game, it appears much more three dimensional than the original. Even though you can only travel on the X-axis, everything from Nathan Spencer (you) to the environments and buildings have more of a 3D look than the 8-bit version. If you remember, or even if you don't, there were particular zones in which your pilot would drop you on the map to partake in the game's action. The red zones on the map are controlled by the Federation (the good guys), also known as the FSA. The white zones are enemy areas controlled by the Empire (the bad guys) where fighting and boss battles take place. 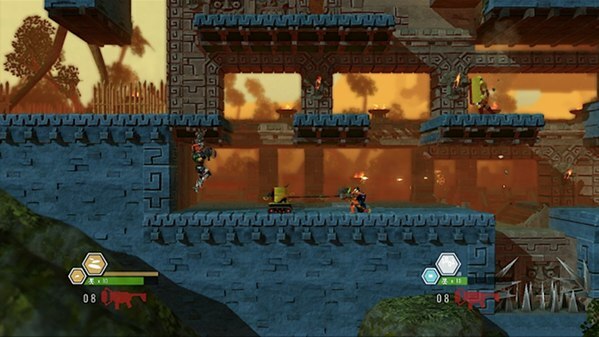 Challenge zones were added to the game's neutral areas to give them more of a raison d'etre, as it were. They were pretty bland in the first version so these areas were added in order to give you something else to do while there. They involve timed challenges where you navigate different areas using your bionic arm. Enemies aren't involved. It's all about using your arm to get around and avoid spikes and other dangers. I didn't do all of these for the sake of time, but the ones I did were fairly entertaining. You get a grade and some extra points out of successful, timely completion. Another addition is the ability to play cooperatively with a friend. Unfortunately I don't know anyone that bought Bionic Commando Rearmed so I wasn't able to partake in this addition, but it's something I would have really enjoyed. One glaring omission is the purposeful removal of all Nazi references. The Japanese version of the game included them, but they were taken out for western audiences as pictured above. As you may recall, Project Albatross was the name for the Empire's plan to re-animate Adolf Hitler. Your job is to stop them and save missing FSA agent "Super Joe". 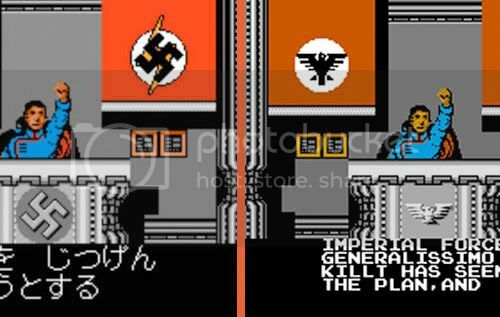 However, the final boss still has an uncanny resemblance to history's greatest monster and he is referred to as "The Leader", a direct English translation of Der Fuhrer. Even so, I hate to see classics cleaned up for the sake of political correctness. Besides, if it could pass in the 80s, why is it faux pas today? While this game doesn't really hold up against today's best selling games with regard to graphics, the gameplay is just as sharp as Modern Warfare or Skyrim. Playing this re-boot of a Nintendo classic brought back some great memories. For fans of the original that are looking for a trip down memory lane, I can't recommend this more highly. It doesn't break any new ground, but it wasn't supposed to. 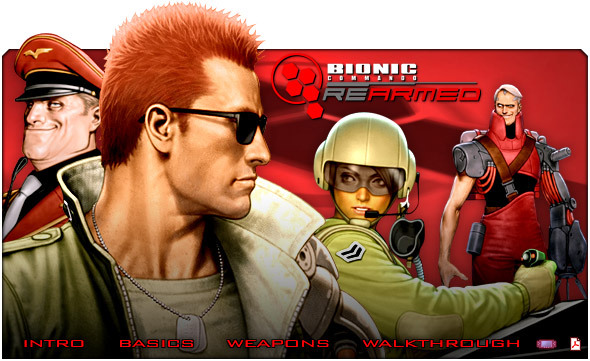 Bionic Commando Rearmed is just a modernized version of the 1980s classic made for those of us who didn't hang on to our 8-bit systems and cartridges for three decades. If you're looking for the next Modern Warfare, you should probably try Battlefield instead. For those of you that are as old as I am and actually owned an 8-bit Nintendo when they were the height of technology, Bionic Commando Rearmed provides a fun gaming experience paired with soothing reminiscence and nostalgia. If you loved the original, you'll love this one, too. Bonuses: +1 for holding true to a bona fide video game classic. Penalties: -1 for caving to PC pressure and removing the Nazi references. Read about our scoring system, in which average is a 5/10 here.